Private, gated guest house - great for corporate stays or a vacation getaway! 2 bdrm, 1 bath detached guest house on a quiet, private, gated property! Welcome home! Fully furnished, 1100 square foot, 2 bedroom, 1 bath detached, upstairs guest home behind a gate. 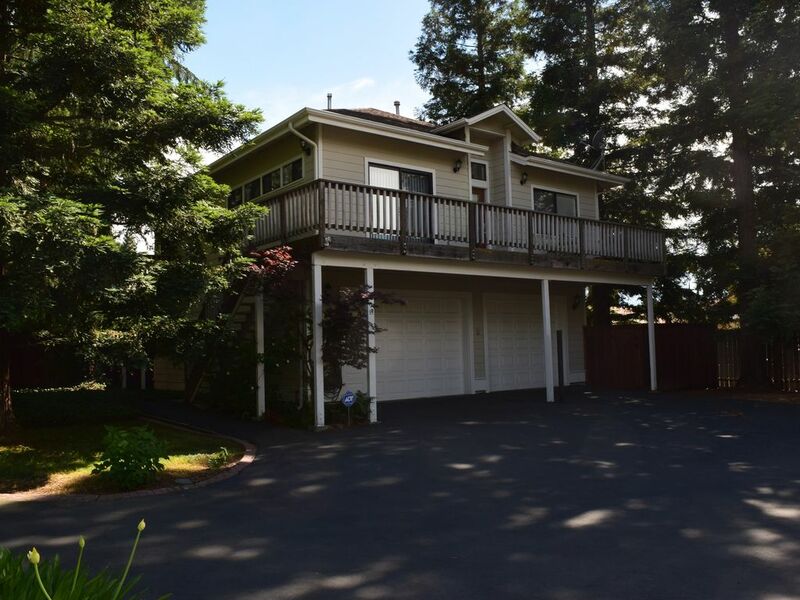 Quiet, secluded and nestled amongst cedar and redwood trees, this guest home is a tranquil oasis that is nonetheless close to everything in the greater Sacramento area! Recently refreshed with new paint and bedding in both bedrooms and new fixtures throughout. New hardwood floors in the living room! Fully stocked kitchen with granite countertops, travertine tile floors, LED HTDVs with DirecTv (and all premium channels) in all rooms (DVD, stereo, Apple TV and iPod dock in family room). Super high-speed, wireless internet throughout. Wireless printer available for use. Weber gas grill available for use. Second bedroom (which can be locked off or available for an additional fee) is set up as an executive office with a comfy, Gel-Luxe queen-sized Murphy bed. Twice-monthly housekeeping is included for stays of 30 days or more. Laundry and grocery pick up/delivery could be arranged for an additional fee. Secure, gated off-street parking available. Garage(s) in picture are NOT included. All utilities are included. Separate, brand new laundry room downstairs with secure access and full-sized washer/dryer with all of the desired amenities. CA native; has lived in Sacramento area for over 30 years. Married with two children - and we enjoy all that northern CA has to offer! We live in the main house, adjacent to the guest house (about 200 feet away). This property is unique in that once you are on the grounds, it feels as if you are somewhere quiet and remote - even though you are in the suburbs of Sacramento and within 15 minutes of downtown. Secluded, quiet - nestled amongst large redwood and cedar trees. All the amenities of home, and more - with the security of a gated property. Washing machine and dryer will be available for use as of 1/1/2018. Regular coffee maker and a Kuerig (pods are offered). 2 (men's and women's) hybrid bikes available for use. HP Wireless printer/copier/scanner available for use. This location was perfect for us. The guest house is well appointed, Very private and quiet. It is like a home away from home. We would definitely stay again. Thanks, Linda! We enjoyed having you and Tom, as well. We hope to see you again soon! Gil was a fantastic host! He is very friendly and helpful which is way more than we expected! The place is very comfortable and clean. They have every thing you need including toiletries and a fully stocked kitchen. We will definitely check here first next time we come to Sacramento!! We stayed 4 days at this property and totally enjoyed ourselves. The home was clean, comfortable and well equipped. So much to do and see there. We both agreed that Carmichael had some of the friendliest people living there. We hope to go back some day. Thank you! We are glad you enjoyed your stay and hope to see you again soon. I had another wonderful visit in Sacramento. The owners welcomed me back and everything was clean and comfortable. I love the that it is close to Whole Foods, restaurants, and main roads. Because of the shade from all the trees I was able to keep the windows open most of the time during the heat and the apartment stayed cool . I would recommend this property to my friends and others. Thank you again. Thank you, Robin! We are so glad you enjoyed our little retreat. Hope to see you again, soon. Relaxing, modern, very well maintained throughout. Very peaceful, modern, well maintained property. Feels like a relaxing retreat. Very comfortable, wonderful bed. Hosts were very attentive and responsive. All the modern amenities one would need. Very private, beautiful trees surrounding property. You will not be disappointed. Thank you Gil! This is a beautiful guest house located in a wonderful area of Sacramento. I will definitely stay here again. I stayed here for 7 nights while visiting the Sacramento area recently. Impeccably clean accommodations. Appliances are tip-top. WiFi super fast. Home entertainment room / system is awesome! The owners are super nice and were very responsive. Gated access, simple parking. Very quiet and safe. I slept like a rock. Within close proximity to parks, shopping and restaurants. If I had a choice between staying at a 5-star hotel or this property the next time I'm in Sacramento I would choose this property every time. Great stay. Thanks, Kevin! You were a great guest, as well. Hope to see you again soon. Up to a maximum of 90 days at a time, unless otherwise negotiated. $100 fee per month for use of second bedroom; $25 per person, per night, above two people.